HomeFate Grand Order[Fate Grand Order/ FGO] Drop your User ID here! 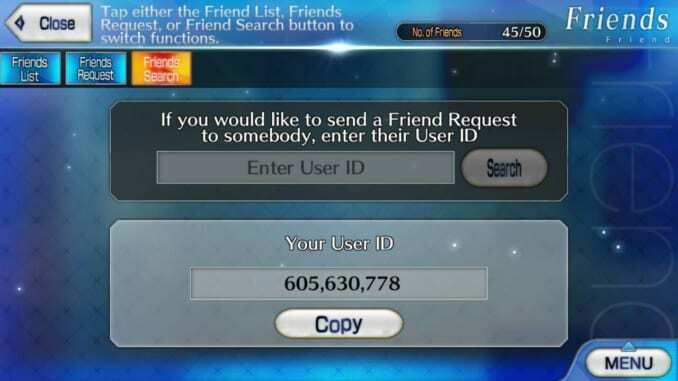 [Fate Grand Order/ FGO] Drop your User ID here! This article contains a page where one can exchange IDs and add more friends for Fate Grand Order [FGO]. This article contains a page where one can exchange their User ID and add more friends for Fate Grand Order [FGO]. Drop your IDs in the comment box below! Click here to check our top page! Welcome to Fate Grand Order! In Fate Grand Order, one can employ a Support Servant. These Support Servants belong to other players who place them on their Support Set-Up Roster. If the User is part of your Friend List then, one can access the Noble Phantasm of the said servant. Adding friends requires one to go into the Friends option in the Main Menu. There, one can click Friend Request and input the User ID to gain more friends. However, take note – one only has a limited amount of friends depending per level. But nonetheless, one can’t have too many friends especially when battling high level enemies. So, there you have it. Drop your User ID in the comment box below and gain new allies to aid one in finishing quests! If you want to add an ID or two, check our writers and players down below. Well, what you’re waiting for? Drop your ID here and find some friends! not sure if your still updating and playing the game but please do update some of your articles as well as covering more ground in regards to events. as i think it will draw attention to your site. just stumbled on your site in regards to the alter event.